It's hard to believe that Summer is quickly drawing to a close and Fall is on the way...seems like it was just Memorial Day, and now Labor Day is coming up! To enjoy the best of Summer veggies like tomatoes and zucchini, this week's #SundaySupper participants are sharing our favorite tips to harvest Summer produce for use when the weather turns cooler. Our hostess is Caroline from Caroline’s Cooking. She encouraged us to share our favorite tips to keep the Summer flavors going all year long. I have to admit that I'm not that great at canning or preserving food...but freezing in-season produce to use later is so simple anyone can do it! I recently found an easy-to-understand step-by-step tutorial via wiki-How that shows how to properly prep zucchini and other squash that lets me enjoy their Summer fresh flavor on the coldest of Winter days! However, for now? 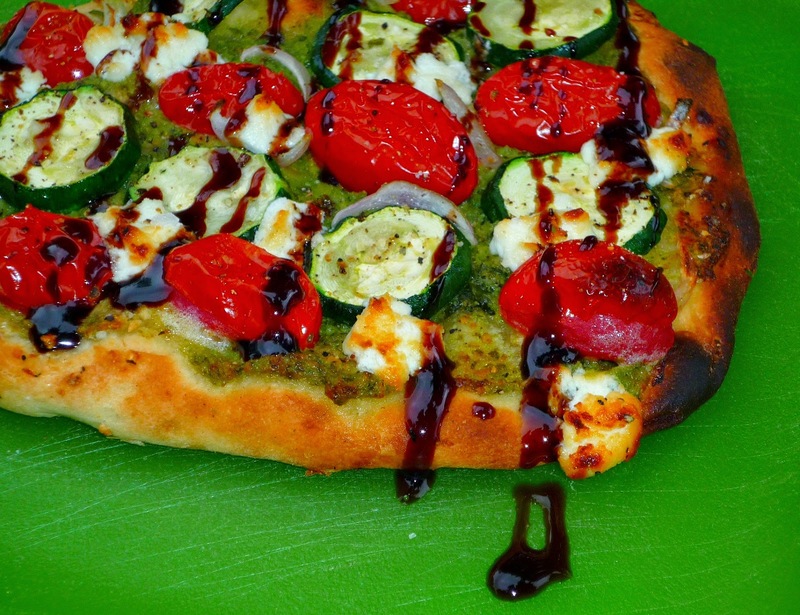 I'm taking advantage of economical, in-season zucchini to create lots of great dishes...like my Tomato-Zucchini Pesto Flatbread with Chevre and Balsamic Drizzle. These veg-friendly flatbreads are super simple to make and bursting with flavor -- perfect for busy weeknight dinners! Step 1: Preheat oven to 400. Place parchment on a rimmed baking sheet. 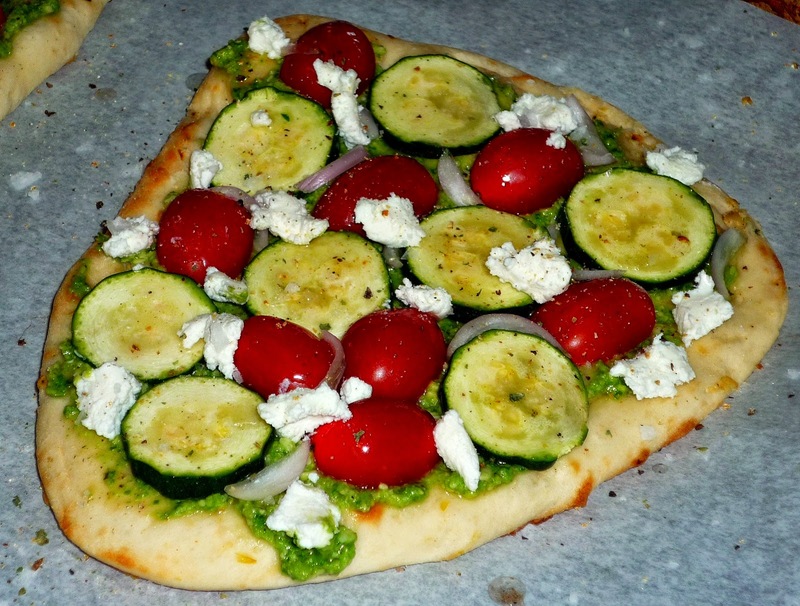 Lay the flatbreads on the pan and top each with 1/3 cup of the pesto. Spread the pesto in an even layer on the flatbread base. 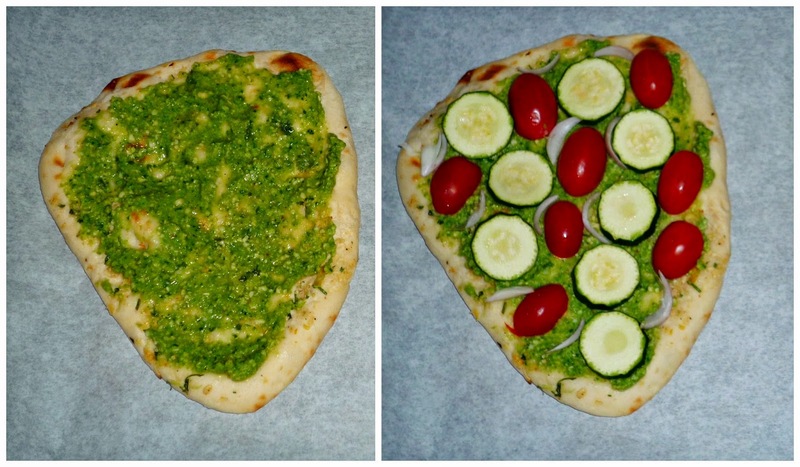 Alternate the tomato halves and sliced zucchini on top of the pesto. Scatter the sliced shallots among the veggies. Step 2: Break off small bite-sized pieces of the chevre and nestle it evenly on the flatbreads among the veggies. 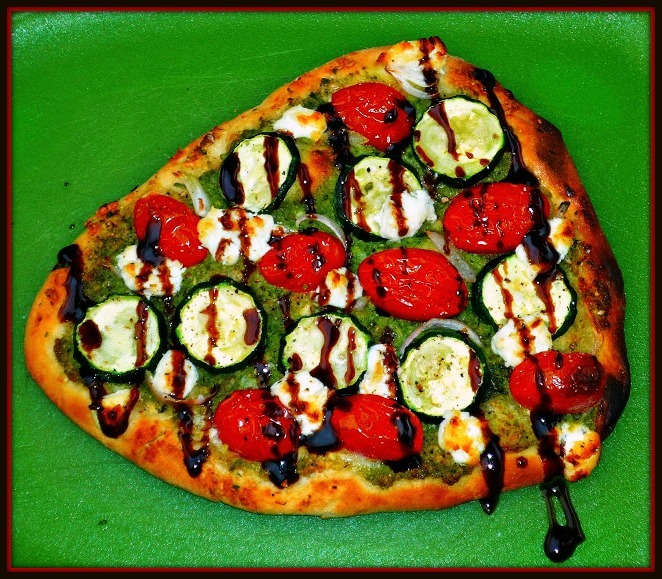 Drizzle each flatbread with olive oil, then top with the coarse sea salt and fresh-ground pepper. Step 3: Bake the flatbreads for 10-15 minutes, until the veggies are cooked and the tomatoes begin to wrinkle. Turn the heat to broil and carefully monitor. Broil just until the naan is golden-brown on the edges and the cheese begins to bubble. Just before serving, drizzle each flatbread with the reduced balsamic glaze. 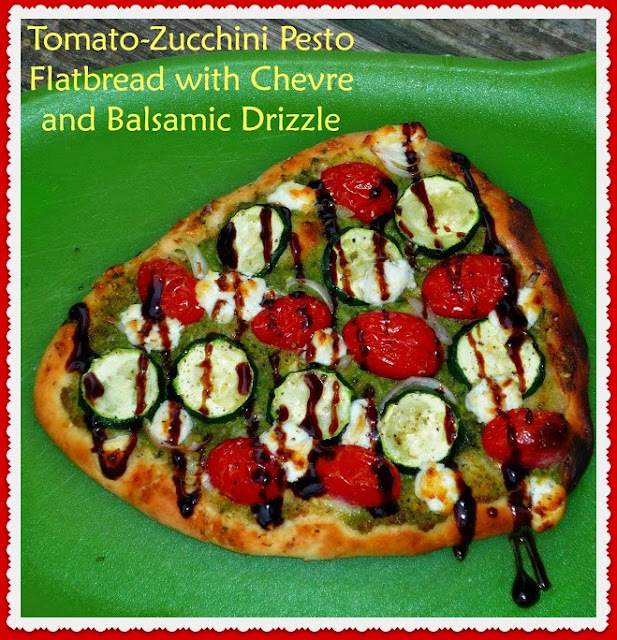 These flatbreads are truly an explosion of flavor! The crunchy garlic naan, earthy zuchhini, garlicky basil pesto, creamy chevre, and sweet-tart tomatoes work perfectly together. The mild onion-like shallot flavor and sweet-sour balsamic drizzle provide a nice burst of flavor to each bite. I think that a sprinkle of pine nuts on top just before baking would work nicely here too -- if you have them on hand. Just wait until you see all of the other fantastic Summer Harvest recipes this week's #SundaySupper participants are sharing! Be sure to join the #SundaySupper conversation on Twitter all day today! We tweet throughout the day, and we share recipes from all over the world. Our weekly Twitter chat starts at 7:00 pm ET/6:00 CST. Follow the #SundaySupper hashtag, and remember to include it in your tweets, to join in the chat. To get even more great Sunday Supper Recipes, visit our website or check out our Pinterest board. Would you like to join the Sunday Supper Movement? It’s easy! You can sign up by clicking here: Sunday Supper Movement.